Two years ago, at the peak of the drought in the Horn of Africa, up to 1,500 people a day were coming from Somalia into Kenya, and headed for the refugee camps around the border town of Dadaab. A large entourage of reporters, photographers and film crews chronicled their movements. The journalists are long gone, but an estimated 450,000 Somalis remain. Their plight might no longer make good fodder for the nightly news, but they still need food, water, and shelter and sanitation in this virtual city that sprang up almost overnight. This is the reality of trying to keep a refugee camp from turning into a disaster. Disease can rapidly overwhelm a small, crowded camp without waste management, latrines, access to safe water and promotion of good hygiene. Putting those measures into place, and keeping them there, is hard work. It's lifesaving work. And it's the work Catholic Relief Services is doing here in Dadaab. "Diarrheal disease, the second leading cause of death in children under the age of 5, is preventable if appropriate water, sanitation and hygiene infrastructure and practices are in place," says Katherine Cunliffe, the CRS regional technical advisor for water, sanitation and hygiene, who has been working in Dadaab since 2011. "In emergencies," Cunliffe adds, "there is often an increased risk of diarrheal disease transmission in camp settings because of overcrowded, unsanitary conditions. If appropriate hygiene and sanitation measures are in place in camps, these tragic deaths can be prevented." In Ifo, one of the camps around Dadaab, that hard work took the form of disinfecting 2,000 latrines after a cholera outbreak, an effort that cost $1,000 in labor alone and took 20 days. Without such work, though, a cholera outbreak in one camp could quickly spread to another—or even into Somalia. It's far easier and more cost effective to prevent the disease than to respond to an outbreak. And it saves lives. CRS undertook the task of providing sanitation and hygiene services for 30,000 people in Kambioos, Dadaab's newest refugee complex, which comprises five camps. With generous funding from Caritas Internationalis and private donors, CRS is working with the local community to build latrines and hand-washing stations, and helping to create an effective garbage removal system—all critical steps for stopping the spread of disease. All that changed when CRS gave each family its own latrine. It then became prestigious to have a well-cared-for latrine. CRS hired hygiene promoters like Ahmed to visit homes daily and explain the importance of hand-washing and good hygiene. Hygiene promoter Hassan Ahmed begins his day by slipping on rubber gloves, filling a bucket with water, and grabbing disinfectant soap and a broom to scrub his family's latrine on their compound in the camp. 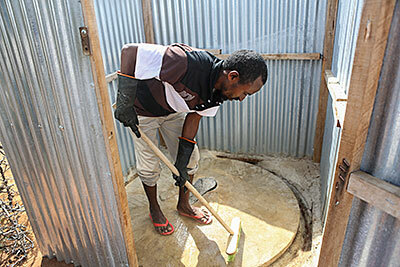 He noticed improvements at the camp in early 2012, when CRS started providing one latrine per family. The previous arrangement, made at the height of the emergency, was latrines shared by five adjacent homes. "Blue flies were everywhere in the camp, just like the plentiful leaves on a tree," recalls Ahmed. "We thought they were causing infections in our children. We sometimes fed our children under mosquito nets. We realized later the blue flies were plentiful because the latrines were not disinfected. Since we began disinfecting our latrines, the blue flies have gone down." With five families sharing a latrine, people quarreled over whose turn it was to clean it. Women felt uneasy sharing the space with men outside their own families. Some people stole the corrugated tin walls to use for home construction. All that changed when CRS gave each family its own latrine. It then became prestigious to have a well-cared-for latrine. CRS hired hygiene promoters like Ahmed to visit homes daily and explain the importance of hand-washing and good hygiene. As each latrine was built and handed over, Ahmed and the other 79 camp hygiene promoters delivered hygiene kits stocked with the supplies for keeping families, latrines and households clean. 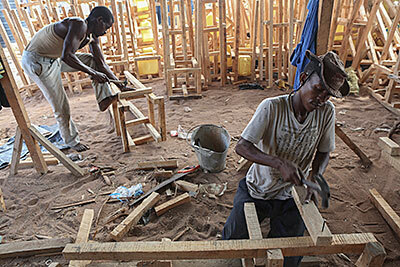 The metallic racket of hammers on wood pierces the air around a CRS hand-washing station construction site. About a half-dozen men hired from the local community join planks of rough wood into chest-high platforms large enough to hold a 2-gallon jerry can. After placing each can on the platform, Abdikadir Guhad Matan picks up his hammer one last time and quickly pounds a series of holes into the thick yellow plastic. When it comes to a well-functioning sanitation program, details matter. "The key to a good hygiene and sanitation program is creating positive behavior change so that infrastructure that is developed is used and maintained," says Cunliffe. "There are many intelligent and well-educated people out there that know it is important to wash your hands after using the toilet, but they still do not always do it. What we, as CRS, have to do is to identify the barriers to good sanitation and hygiene practices, and what motivates someone to want to practice good hygiene behaviors." In resource-poor Dadaab, some people may be tempted to sell a brand new jerry can rather than use it for hand-washing or water collection. However, the holes Abdikadir makes means that the cans work perfectly when laid on one side to hold enough water for hand-washing, but leak if used for any other purpose. Workers place the stations right outside the family latrine as a reminder to wash hands after using the facilities. As further encouragement, each family member receives his or her own bar of soap every month. In the Kambioos camp, families greet the day by sweeping their compounds and gathering garbage into tidy piles outside the sticks-and-brush gates around their homes. The clip-clop of hooves announces the arrival of the garbage "truck"—a donkey pulling a cart—and one of the 63 refugees hired as the garbage collectors of Kambioos. Women hired to collect garbage gather the small piles of waste outside each compound, battling the wind to keep the waste from blowing away. Hooves kick up powder-fine dust. 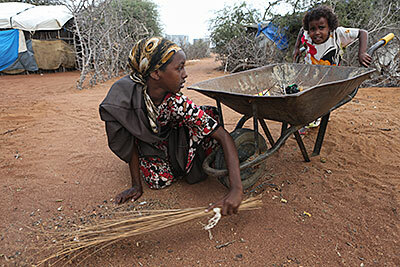 Children approach with wheelbarrows of garbage, and others lobby to get the next turn at sweeping the ground with brooms fashioned from leaves and twigs. The cart quickly fills with scraps of metal, plastic and wrappers that the collectors will sort later at the small waste site about a half mile outside the camp. In less than 2 years, the waste removal system and bathroom facilities in Kambioos have come to resemble those of a well-functioning, small city. "I may be healthy or my family may be healthy, but if someone in my community gets sick, my family can also get sick," Ahmed says, reflecting the sense of responsibility for health and hygiene now endemic in Kambioos. "The only way our community can be healthy is to join together and use hygiene promotion: cleaning our compounds and latrines—and hand-washing—to make sure our community stays healthy." Ahmed dreams of returning to Somalia someday with his family. In the meantime, he's joined with CRS to keep his community healthy enough to reach that day.